Once again, the LC is here to introduce you to one of our rare and exotic gemstones. Some finer gems are occasionally found in black, but the highest quality black gemstone is Australian black tourmaline. Continue reading to discover why! Tourmaline is one of the most colorful gemstones of all because it occurs in practically all colors. Scientifically, tourmaline is not a single mineral, but a group of minerals that are related by their physical and chemical properties. Its name comes from toramalli, which means “mixed gems” in Sinhalese. Black tourmaline consists of the mineral schorl, which is one of the four members of the tourmaline group. Schorl is rich in iron and forms in a wide variety of rock types. It’s seldom used as a gem, which makes Australian black tourmaline very rare and exceptional. Like all tourmaline, black tourmaline is quite hard (7 to 7.5 on the Mohs scale), which also makes it a very durable gemstone. It has a vitreous, slightly resinous luster and takes a good polish. Gem lore states that black tourmaline repels negativity and protects the wearer. It is said to be a very good stone to wear if you feel stressed. Be sure to explore our vast collection of this rare and exotic gemstone during our Australian Black Tourmaline Show today from 12 p.m. to 8 p.m. CT. From stunning rings to exquisite pendants, the LC has gorgeous Australian black tourmaline jewelry pieces to add to your own collection. 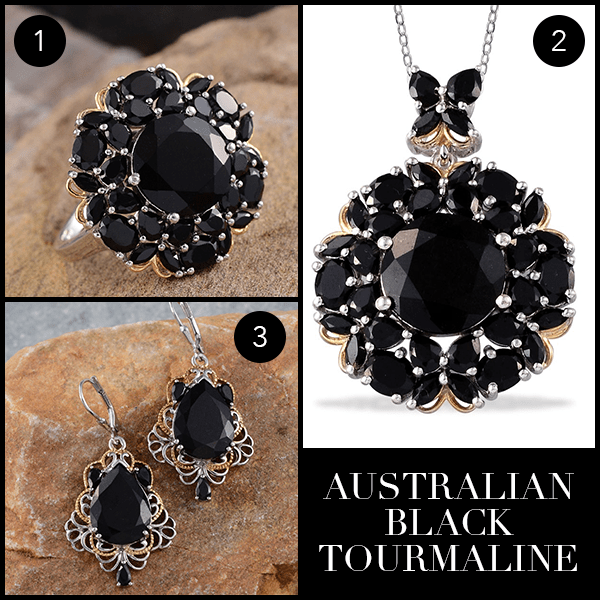 What do you like about Australian black tourmaline jewelry?